“Music by Mozart”, photo by Sigrid Redpath. By LIZ BYRON. 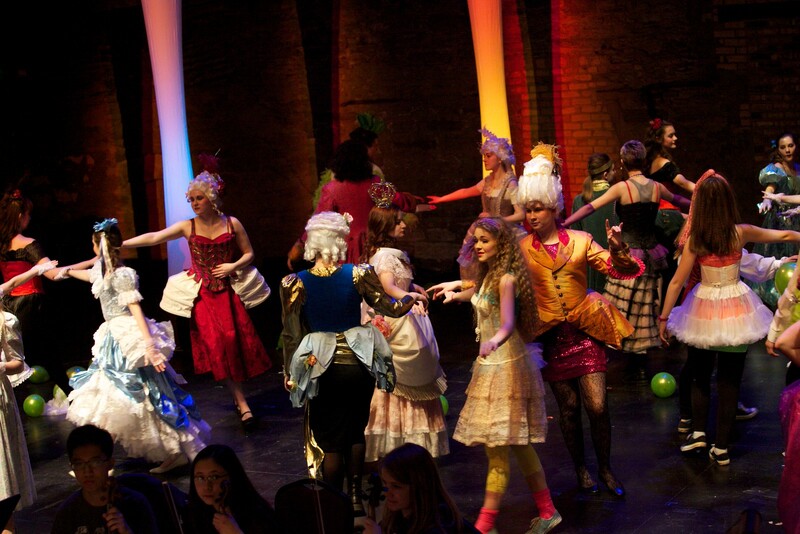 Project Opera’s Music of Mozart is described as “a Mozart Dance Party – 1980s style”. Picture teens with crimped hair, Madonna-inspired fingerless gloves, and neon t-shirts. Now picture 18th century high-piled wigs, bustles, and velvet waistcoats. Now mix them together, and add some Magic Flute, and you’ve got it. 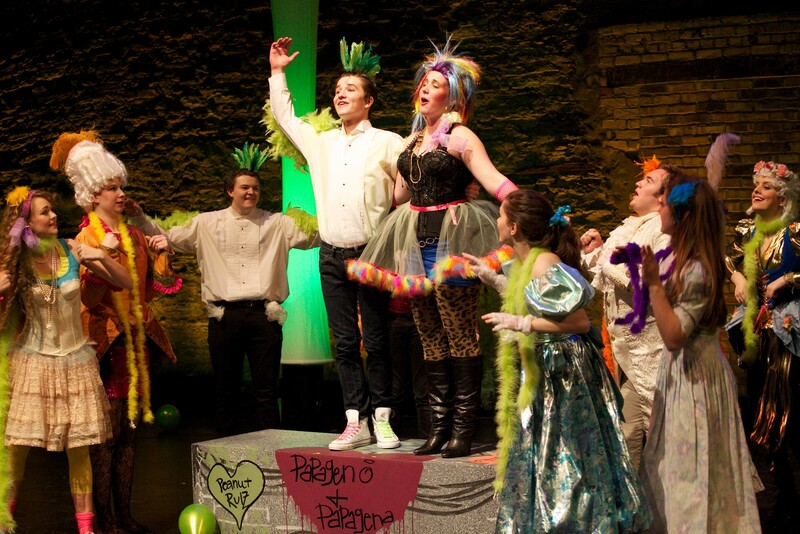 Project Opera is the youth training program put on by Minnesota Opera; they work with talented young people in grades 4-12. Every year they put on one production that is described as “by kids, for kids.” Now, this is not your average high school musical — these kids have some serious talent. In fact, there is a risk that you will watch them and feel a little embarrassed about how much more talented they are than you. At least, I felt that way.. but mostly, I was impressed. The Minnesota Opera has a reputation as being a company that pushes the envelope a little, and works hard to reach out to the public and particularly encourage a younger audience to attend the opera, and Project Opera’s Music of Mozart does a great job of doing just that. By putting Mozart’s works into a modern context, the songs come alive in a new way. As someone who regularly tries to teach classic (read: old) works to teenagers, I am a firm supporter of anything that helps today’s youth connect with stories from the past. It lets them see the timeless nature of certain tales if they can draw parallels between the characters on the page and their own lives. “Music by Mozart”, ensemble. Photo by Sigrid Redpath. the handsome one) from Così fan tutte in a high school dance, where two girls are eyeing two boys they want to dance with, makes all sorts of sense, and the idea to transport The Marriage of Figaro‘s Cherubino from being caught in a woman’s bedroom to the girl’s bathroom at school — genius. On the other hand, Hm! Hm! Hm! from The Magic Flute (wherein Tamino is given the titular flute) just feels like the original version, with people in funny clothes. And lest you read this paragraph and realise you don’t know the stories of any of these operas, rest assured: it doesn’t matter. The production, being a “mash-up” of different pieces from different operas, comes with clever introductions projected above the stage (in neon lettering, of course) to explain what is happening. The performances are a little uneven, but none are bad, and some are truly amazing. Stand-outs include Alexis Cairy and Clare Tichawa‘s take on Via resti servita (after you, gracious lady) from The Marriage of Figaro, and Miranda Kettlewell and Claire Walsh in Come ti piace imponi (command me as you will) from La Clemenza di Tito. Overall, Music of Mozart is worth seeing. The music is good, the costumes are ridiculous and fun, the staging is absolutely entertaining, and the energy and talent of these kids is pretty much amazing. If you like opera, you’ll enjoy the new approach to Mozart, and if you don’t like opera, I urge you to try this one: it’s extremely accessible to non-opera lovers (and is only 80 minutes long). And I will add that, in my not-so-humble opinion, more operas should have slow-motion chases and prom kings and queens. Something to consider.